The first missionary I remember meeting was Lillian Dickson, a short, stout woman who could tell spell binding stories about far-away places. As a seven year old, I sat in rapt attention and listened to tales about an island off the coast of China called Taiwan where many people were hungry, homeless, and needed clothes. I’ve met well over a hundred different missionaries since, but “Miss Lillian” is the one who impacted my life the most. Between 1959 and 1972 “Miss Lillian” was in our home many times. 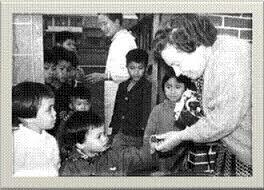 She led “The Mustard Seed,” a ministry in Taiwan that cared for hundreds of adults and, over the years, thousands of children. Reader’s Digest featured an article about the “Littlest Lady With the Biggest Heart” in 1962 which launched annual trips to North America for speaking tours to raise money for the mission work. Dad coordinated many of those tours. When Dad died in 1981, “Miss Lillian” called to offer condolences and soon had me smiling at the memories of my duties when Dad and Mom took her to various churches to speak. As a ten year old, it was my job to carry the giant Los Angeles telephone directory, which she sat on in the car, into the church so she could stand on it when she spoke. Unforgettable! Don’t ever pass up the opportunity to get to know a missionary. You never know how God might use that person in your life – or in the lives of your kids and grandkids.